John was born on 6 February 1884, the son of George Bellinger and his wife Elizabeth née Wright. His father was a bricklayer. By the time of the 1901 census his eldest sibling, Alice, had already married and left home; presumably to escape the cramped conditions in the family home in Adey's Buildings. John was staying with Alice and her husband. Even with these two missing there were eleven of the family in their small terraced house. Elizabeth died in 1909, further complicating the care for the children. John married Phoebe Lovelock on 21 September 1907 and their first, and only child, Evelyn Maud, was born on 11 March 1909. They lived in Ashton Court in Newbury. Ashton Court was one of the many courts and yards leading off Newbury's main streets, filled with small cottages where most working class Newburians lived, many of them little more than slums. Ashton Court was behind the Falkland Arms on the east side of Bartholomew Street. The whole area was flattened in the 1970s and is now covered by the Kennet Centre shopping complex. When war broke out in 1914 it did not take John long to decide to 'do his bit'; he enlisted in December 1914 joining the Royal Berkshire Regiment. Initially he would have been assigned to the 3rd Battalion, a training unit that supplied men to the combat battalions (at this time the 1st and 2nd Battalions). In May 1915 he was one of many sent to France to join the 1st Battalion as a replacement. The British were planning an attack on the German lines near the coal mining town of Loos-en-Gohelle in northern France, part of a major Anglo-French offensive known as the Battle of Artois. This element of the larger offensive was to earn its own name as the Battle of Loos. It was the first time the British used poison gas (chlorine). Official news has been received by Mrs Bellinger, of 5, Ashton-court, Bartholomew-street, Newbury, that her husband, Pte J Bellinger, of the 1st Royal Berks, has been missing since September 28th. He enlisted on December 29th, went through his training at Portsmouth, and left for France in the 4th of May. His wife and friends would be glad to receive any information regarding him. His family were left wondering if he might have survived, but, as the days and weeks passed with no news of him being a prisoner of war their hopes must have faded. Almost a year after the attack John's wife received official notification that he was being assumed dead. Notification has been received by Mrs Bellinger, of 5, Ashton Court, Bartholomew-street, Newbury, with a letter of sympathy from the King and Queen, of the death of her husband, Pte J Bellinger, 18215, of the Royal Berks, who has been missing since September 28th, 1915. Deceased, who was formerly employed by Messrs Plenty and Son, King’s-road, Newbury, joined the service in December, 1914, and left for France on May 4th, 1915. Another brother, Acting Leading-Stoker W Bellinger, was lost May 31st on HMS Queen Mary, in the Jutland Battle. 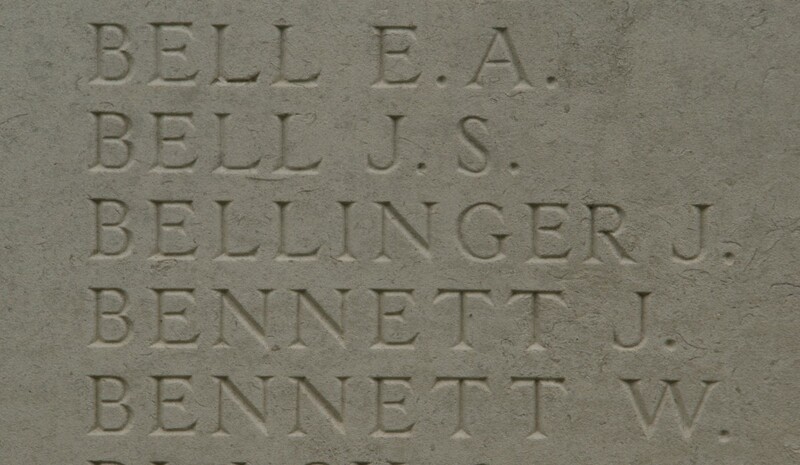 John Bellinger's name on the Loos Memorial. After the war a number of memorials were erected near the battlefields to commemorate the names of those men whose bodies were never found or identified. 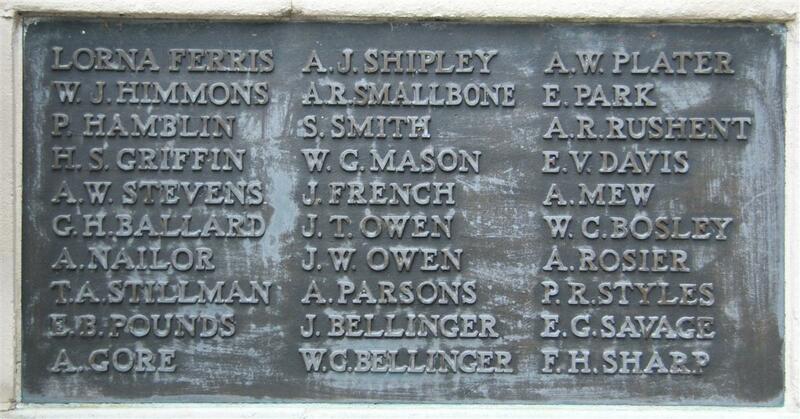 John Bellinger's name is recorded on Panel 93 of the Loos Memorial at the Dud Corner Cemetery just outside the town. Locally John is remembered on Panel 1 of Newbury's Town War Memorial, on a memorial board and a roll of honour in St Nicolas' Church, Newbury, and on the impressive memorial in the United Reform Church, Newbury. As mentioned in the newspaper item above, his younger brother William was lost at the battle of Jutland, his story can he found - here. 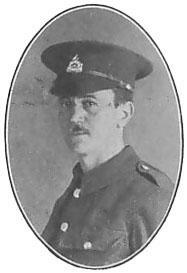 He also had a cousin, John Preston, who died serving with the Royal Berkshire Regiment. His relationship with Preston was complicated when his father married Preston's mother in 1912 (their mother's were sisters Elizabeth and Ann Wright). Following this marriage Preston was both cousin and step-brother.